The next PlayStation accessory could be a confusingly-named tablet. Sony has a habit of filing patents for all sorts of potential products that may or may not see the light of day. However, a recently published patent for a tablet-esque PlayStation controller has raised a few eyebrows, and not just because of its suspiciously familiar name. The "PlayStation EyePad" is the latest development in the series of "Eye" accessories like the PlayStation Eye and the EyeToy before it. The hypothetical controller is dominated by a large flat surface in the center, which could be a number of things: a display screen, a touchscreen, or a Vita-style touchpad (it doesn't appear to be set in stone). Flanking the main screen are the classic PlayStation controls, including a D-pad and four buttons, though the EyePad has only one analog stick. What sets the EyePad apart is its grab-bag of miscellaneous features. The corners of the main screen contain paired stereoscopic cameras. This means that an object placed in the middle of the controller could be scanned from all angles, allowing anything that fits in the space to be rendered as a full three-dimensional model in a game. The system also makes it possible to use the cameras to scan players' faces, so you can make your in-game character's face match your own real-life mug. In addition, four glowing LED strips are embedded in the sides of the rectangular controller, which allow it to be recognized by the PlayStation Eye for motion-tracking. This could allow the EyePad to be used as a substitute for a PlayStation Move controller, though the device itself is very different in shape and size from the traditional Move wand. 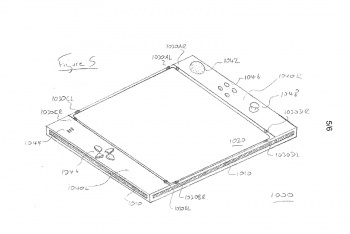 It's worth noting that this patent doesn't guarantee that the EyePad will ever make it past the prototype stage. If it does end up hitting shelves, though, be prepared to look for it under a different name. The "PlayStation EyePad" seems to be a working title, and Sony probably knows better than to step on Apple's toes with misleading homonyms - it wouldn't be the first time the lawyers at Apple have gone after similarly-named products.